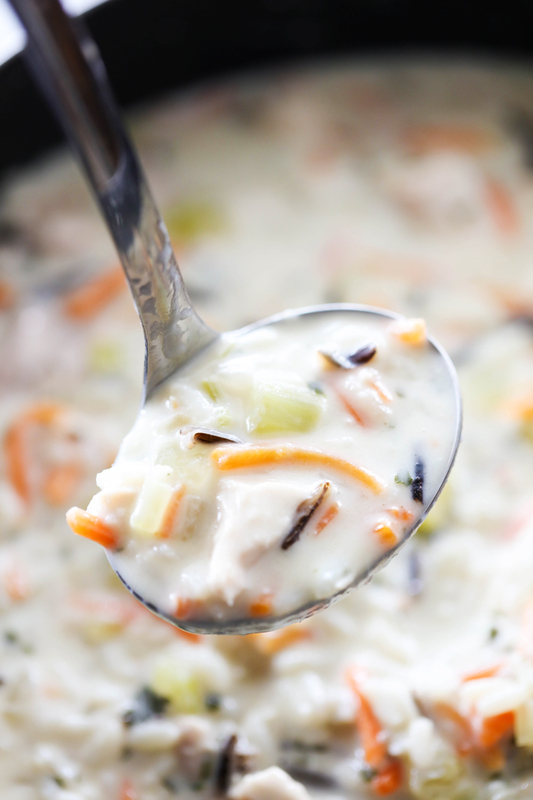 This Chicken and Wild Rice Soup is a quick and easy meal jam packed with yummy ingredients and flavor! It is sure to become an instant new family favorite! This winter has been insane. We received several feet of snowfall in a short amount of time and then rain and warmer temperatures came. It is cold and wet and all I like to do on rainy and/0r snowy days is stay inside and watch it from my windows. These days I crave nothing but soup! 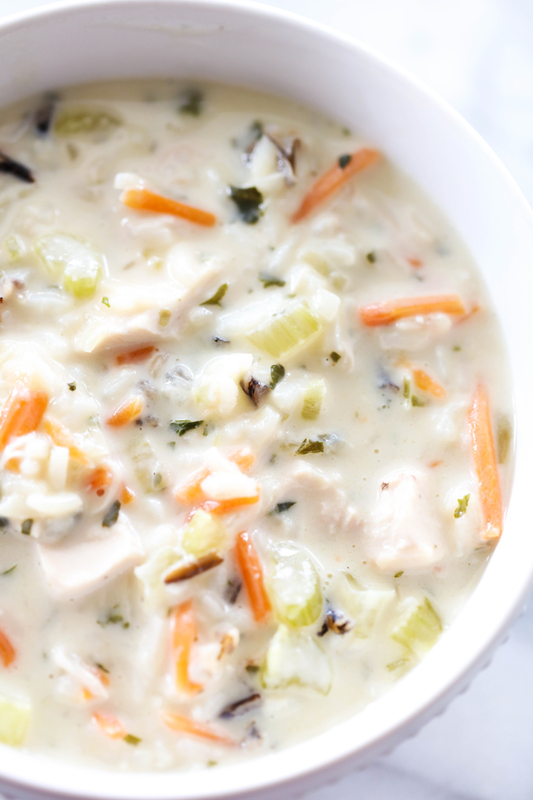 This Chicken and Wild Rice Soup recipe comes from my Aunt. Over Christmas Break my entire extended family got together and we had a soup and salad bar. My aunt made this soup and everyone went crazy over it! It was one of the most popular ones there. She so kindly gave me the recipe to share with all of you. Trust me, you are going to want to make this one ASAP! In a large pot add onion, carrots, celery and olive oil. Sauté for 3 minutes until tender. Add Uncle Ben's rice and cook until rice is tender. Add chicken and cook another 3 minutes. 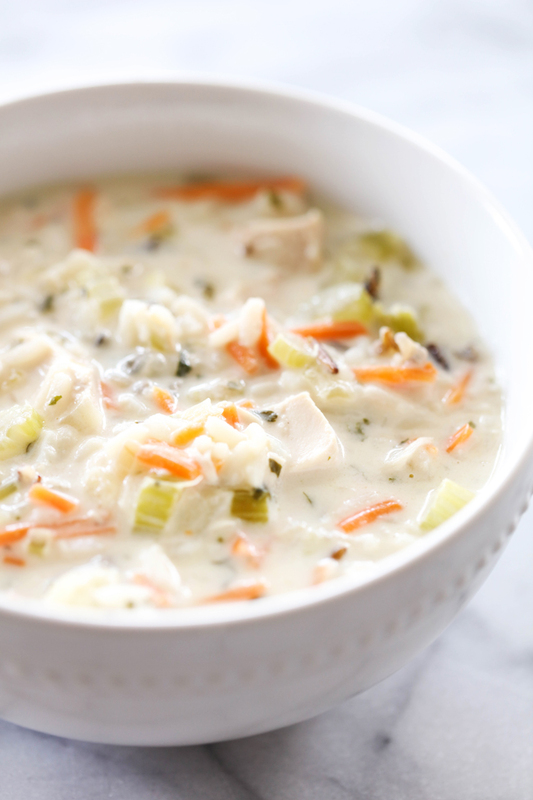 To thicken, in a small bowl combine ¼ cup chicken broth to 3 Tablespoons cornstarch. Add to pot and cook another 3 minutes. I made this soup and loved it! I'd have to say winter has been pretty tame for us in Atlanta compared to winter where you are, BUT that hasn't stopped me for reaching toward hearty soups lol. This sounds absolutely perfect and absolutely delicious. Bookmarking ASAP! I love that I have all the ingredients in my pantry and refrigerator! I am trying this tonight! I think you should quit calling yourself a "chef in training" You already are a CHEF!!!!! Recipe is great but I did change the cooking part it to a crock pot recipe and it turned out fabulous! Hi I made your Chicken and Wild Rice Soup it was wonderful gave the recipe to my daughter and daughter in law. Hi! Maybe a silly question, but do you add the seasoning packet that comes with the Uncle Ben’s rice or just use the rice mix?